Satellite operators and service providers spend a considerable amount of time on their attempts to reduce interference. There are both capital and operational expenses incurred for this effort. Capital expense elements include investment in high value tools such as those from Integral Systems, Glowlink, or Crystal Systems. Operational expenses can include subscription-based plans from Integral Systems and Glowlink. In addition, there are personnel dedicated to identifying and reducing sources of interference. There is also the lost opportunity cost; partial or whole transponders not available for use by the satellite operator. There are long- and short-term causes of interference. Long-term may be from adjacent satellites, which would be due to either lack of coordination between users, outdated or poorly designed equipment, or small mobile antennas. In addition to these reasons, there may be deliberate interference for political reasons, or terrestrial sources, such as microwave links or radar. Short-term causes may be from users, such as cross polarization, or transmitting on the wrong frequency or satellite. It may also be caused by equipment malfunctions or incorrect back-up configurations. The types of interference are predominantly designated by satellite operators as unauthorized carriers or from incorrect cross/co-polarization; approximately 80 percent of interference events are between these two types as reported by the operators. Interference has a financial impact as well to satellite operators and users. When there is interference on a transponder, there is revenue lost due to the reduction of available bandwidth and power capacity. Expenses are increased, ranging from the purchase of interference monitoring or geolocation equipment, or dedicating personnel to interference mitigation. Geolocation systems may be purchased, with costs upwards of $500,000 per system, and a monthly recurring fee of $15,000. There are per- use arrangements for geolocation. These are priced in the range of $20 to $30,000 per year per satellite; they are not available in all frequency bands in all regions. Ultimately, this is a quality of service issue that is unique to wireless services. 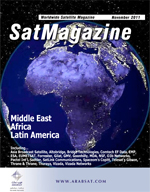 Satellite interference has become such an acute problem that a satellite industry-wide group was created to address it. The Satellite Interference Reduction Group (sIRG) members include satellite operators, service providers, broadcasters, and equipment manufacturers. Recently, three working groups were formed within the sIRG to address different segments of the satellite industry. The Broadcast, VSAT, and Data groups are pursuing approaches to mitigate interference that are unique to their segments of the market. The sIRG has suggested a mandate that by January 1, 2015, all new equipment that transmits a satellite carrier will have Carrier ID capability. The Broadcast group within the sIRG has agreed to implement a procedure for injection of the Carrier ID. Their proposal is that the ID will be injected in the Network Info Table (NIT) frame on the video encoder for MPEG transport streams. There is an issue with this approach, namely that when a carrier with the NIT ID enabled is experiencing interference, the NIT is no longer able to be read. The sIRG is searching for techniques to address installed legacy equipment for VSAT and data modems. The challenge here is with the multitude of different products from different manufacturers. Comtech EF Data developed a technology called MetaCarrier that is used to embed and detect Carrier ID on video and data satellite carriers. The Meta prefix is used in its meaning of a carrier used to describe another carrier. In this case, MetaCarrier means that we have a separate carrier that contains information, which is used to describe another single carrier, a group of carriers, or a relay, such as a satellite transponder, or terrestrial wireless relay. What is unique is that the MetaCarrier is embedded using spread spectrum techniques within the carrier(s) or relay, without adding appreciable noise to the carrier(s) or relay. The MetaCarrier technology overlays the very low data rate Carrier ID data in a spread spectrum carrier, onto the carrier that it is referencing, as shown in Figure 1. It should be noted at this point that this Comtech EF Data is technology in development; products resulting from this technology are not yet available, but will be in the near future. A decoded Carrier ID may be in the format of Figure 2. The implementation of Carrier ID using MetaCarrier embedders and detectors are illustrated in Figures 3 and 4. In Figure 3, showing an SCPC network, the Carrier ID embedders are in line with the modem, connected between the IF port of the modem and the RF terminal. The site receiving the Carrier IDs via MetaCarrier does not have to be the site receiving traffic. Similarly, in an implementation of Carrier ID in a Satellite News Gathering (SNG) application as shown in Figure 4, the Carrier ID embedder could be an external device or firmware enabled on the modulator. The MetaCarrier approach to Carrier ID has a minimal, almost insignificant, impact on the carrier that it references. It uses power from the referenced carrier and its impact is more pronounced with small symbol rate carriers. However, with a 224 ksps (kilo symbol per second) referenced carrier, the degradation of the referenced carrier due to the MetaCarrier is a tenth of a dB. Figure 5 shows the calculation at this symbol rate. Certainly the utility of Carrier ID is when the traffic carriers are in severe interference. In this situation the goal is to resolve the Carrier ID from both the carrier of interest and the interfering carrier. The MetaCarrier technology approach is robust enough to extract the Carrier ID from both carriers. The image on the spectrum analyzer in Figure 6 shows two carriers each with a MetaCarrier, and not interfering with each other. In the equipment rack are two modems; one with an external MetaCarrier Carrier ID embedder, the other with an internal, firmware based MetaCarrier Carrier ID embedder. The external embedder has one red LED indicating that a GPS source is not present. One can see that the demodulator LEDs are lit green, indicating that traffic is passing. On the top of the rack is a MetaCarrier Carrier ID detector that is locked on the MetaCarrier. Below the spectrum analyzer is a PC that is connected to the MetaCarrier Carrier ID detector and displaying the Carrier ID from the modem with the firmware embedder. The non-interfering carriers were then moved closer to each other in frequency such that they almost completely overlapped. In Figure 7, one can see on the spectrum analyzer that the carriers are interfering with each other to the point that the demodulators are not locked on the modems, as indicated by the red LEDs. However, the MetaCarrier Carrier ID from the modem with the firmware version of the embedder is detected, locked, and displayed. Although it is surprising that even now, in a 50-year-old industry, there is no provision for a universal identification of carriers on a satellite, the ability to do so for video and SCPC carriers is at hand with the MetaCarrier approach. This technology has been demonstrated by a number of representatives from satellite operators and is ready for industry adaptation. This technology provides the ability to significantly reduce the time to identify and clear transponders of interference sources. It will raise the level of communications quality in the industry and will help to reduce the capital and operational expense now attributed to interference. Most in the industry who are familiar with the issue of interference agree that Carrier ID will not address all interference situations. However, there has never before been a Carrier ID technology soon ready for production that can be used with both SCPC and video carriers, and that addresses all operational and technical concerns. It is time for its implementation by the satellite industry. Frederick Morris is Vice President of Global Sales Engineering. In this role, he is responsible for the technical solutions for Comtech EF Datas customers. Previously at Comtech he was General Manager of Comtech EF Data Vipersat Network Products Group. During his career, Morris has held various senior business development and technical marketing positions. Prior to joining Comtech EF Data, he was vice president of product management and development at Intelsat. Previous to Intelsat, he held the position of vice president of product management and sales support engineering at Verestar. His extensive experience also includes senior level positions in product management and business development at SES Americom, Viacast Networks, and Hughes Network Systems. Morris holds a BSEE degree from the University of Connecticut and an MS in Technology Management from the University of Maryland.